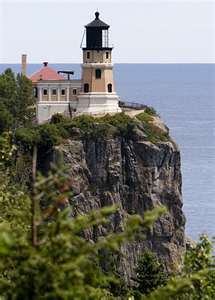 When I was a little girl, my parents took my brother and me to Split Rock Lighthouse on the North Shore of Lake Superior. We returned for numerous visits. I was fascinated with the lighthouse. What fun, I thought, to be the daughter of the lighthouse-keeper! Re-visiting the Lighthouse as an adult, I recognized the lighthouse-keeper’s job was a lonely one. Daily structured. Difficult in the midst of storms. The duty of the lighthouse-keeper, after all, was to keep the light shining no matter what. Wicks needed to be trimmed. Plenty of oil on hand. All equipment needed to be in working order so that nothing prevented the light from shining when fog quickly rolled in or darkness overwhelmed the shoreline. There was another duty. From time to time, the lighthouse-keeper was called down from his lofty place high on the hill to the rocky shore below where hurting lives lay ship-wrecked and in trouble. Such is our duty, too. We are called to shine our lights high on the hill to help everyone see. The light of God’s Word flowing through us warns others of danger and shows the way of hope and salvation. But, when someone is hurting because he or she has come upon hard times, suffering and pain, God’s Word compels us to step down from the hill to offer comfort and care. To help carry the burden. God’s love flows through our servant hands. My friend’s mom, Gladys, came down from her lighthouse countless times to serve the needs of others. Now, it is is the turn of her children and grandchildren to serve. To show their respect. To practice caring. To model what Gladys taught them. I know. I know. Gladys would much rather go to the mansion God has prepared for her, but not yet. Not until God’s work in and through her is done. For now, she can trust that God is doing a work through her for others. She can trust that He is speaking to her about important matters of eternal significance. Then, as Jesus did in the Garden of Gethsemane, she can know that God’s will is being accomplished. Things for Gladys seem upside down. Storms have carried her wrecked and helpless body onto the rocky shore. But, the light in Gladys is still shining. The oil of God’s Word has so filled Gladys that, even as a very sick patient, her light inspires others to kindness. Patience. A servant’s love.